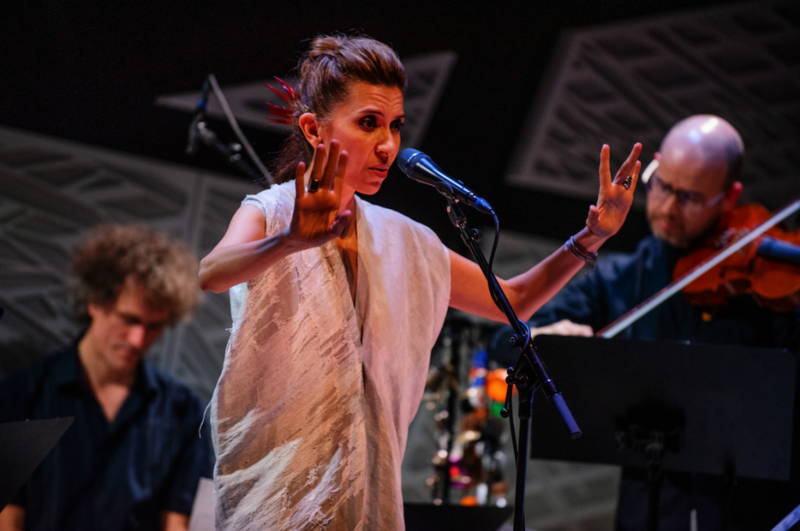 Celebrating the power of beauty as a political act, Magos Herrera teams up with Brooklyn Rider to explore the artistry of poets and dissidents who dared to dream under repressive regimes. Hailed as “the future of chamber music” (Strings), veteran string quartet Brooklyn Rider have drawn rave reviews from rock and classical critics alike. 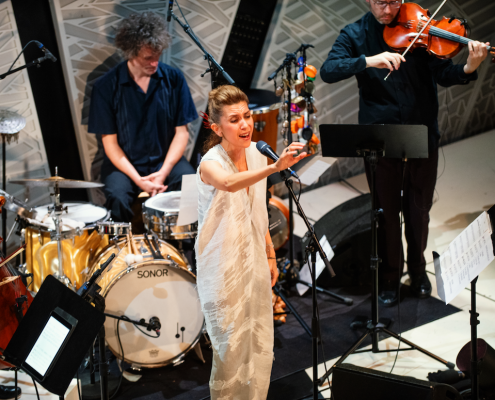 Magos Herrera is a legend in her home country of Mexico, where she’s won critical and popular acclaim for her singular bold style and eloquent vocal improvisations. 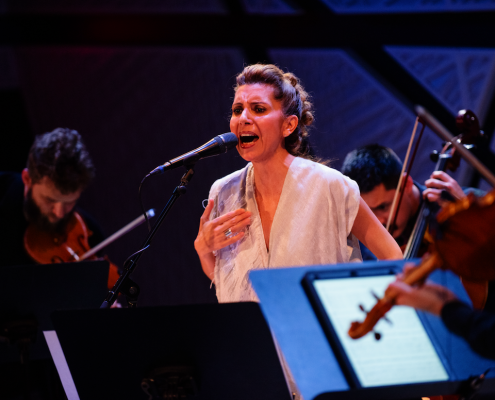 NPR says that Herrera and Brooklyn Rider’s collaborative new project “is drop-dead gorgeous . . . It’s playful. It’s serious. It’s jazzy. 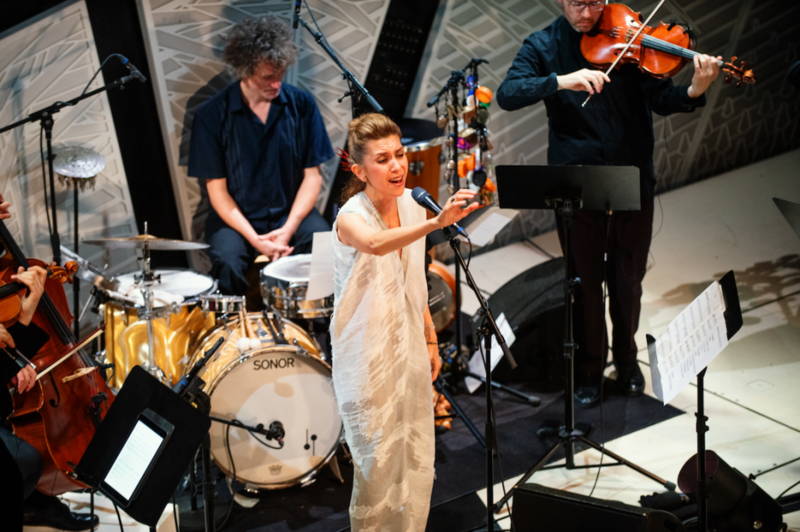 Some tracks defy description.” Delving deep into work imbued with a love of humanity, a belief in possibility, and a demand for justice, Herrera and Brooklyn Rider deploy their extraordinary technique in the service of wonder, lifting audiences into the orbits of these extraordinary songs. Born in Mexico City and currently based out of New York City, Magos Herrera is a dazzling jazz singer-songwriter, producer, and educator. Magos is regarded as one of the most expressive, beautiful voices and most active vocalists in the contemporary Latin American jazz scene. 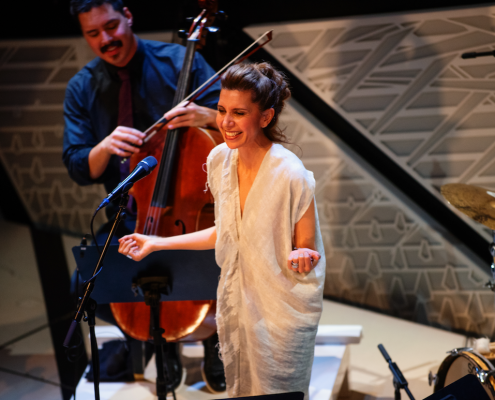 She is best known for her eloquent vocal improvisation and her singular bold style, which embraces elements of contemporary jazz, Latin American melodies, and rhythms sung in Spanish, English, and Portuguese, elegantly blending and surpassing language boundaries. She has recorded six solo albums, worked on joint collaborations for two more albums with producer Javier Limón, and participated as a guest artist on several recordings and albums. An accomplished artist, Magos has performed in a variety of leading international cultural venues such as Lincoln Center, the Kennedy Center, the Palacio de Bellas Artes, Círculo de Bellas Artes, Union Chapel, Duc des Lombards, Kamani Auditorium, and Palau de la Musica. She has also been part of the lineup of some of the most memorable jazz festivals around the world, including the Montreux Jazz Festival, the Montreal Jazz Festival, and the Festival Internacional Cervantino, to mention a few. 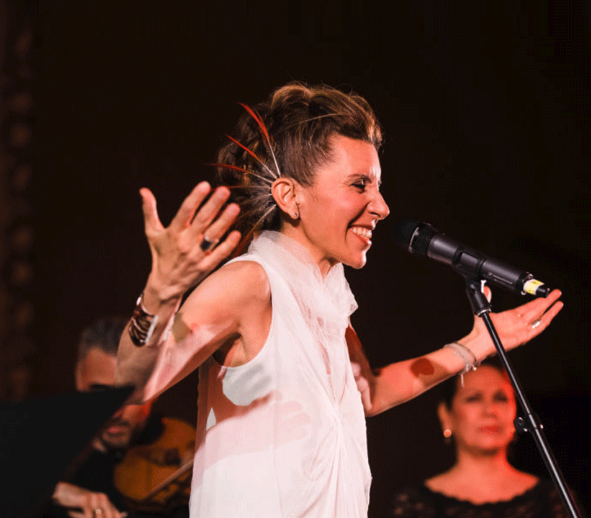 Throughout her career, Magos has garnered important awards and recognitions, including a Grammy shortlist nomination in the Best Jazz Vocal Album category for her album Distancia (2009). She is the only female artist to have received the Berklee College of Music’s Master of Latin Music Award. She is well known for championing women’s causes and currently serves as spokesperson for UN Women, having contributed to important campaigns including UNITE to end violence against women and He For She. 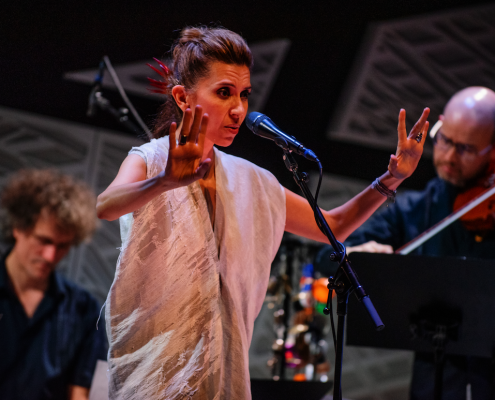 She serves as an artistic advisor of National Sawdust, one of Brooklyn’s most innovative venues, and also serves as a frequent collaborator for radio and television programs in Mexico. Magos produces and hosts a weekly radio program from New York for Mexico’s Public Radio. 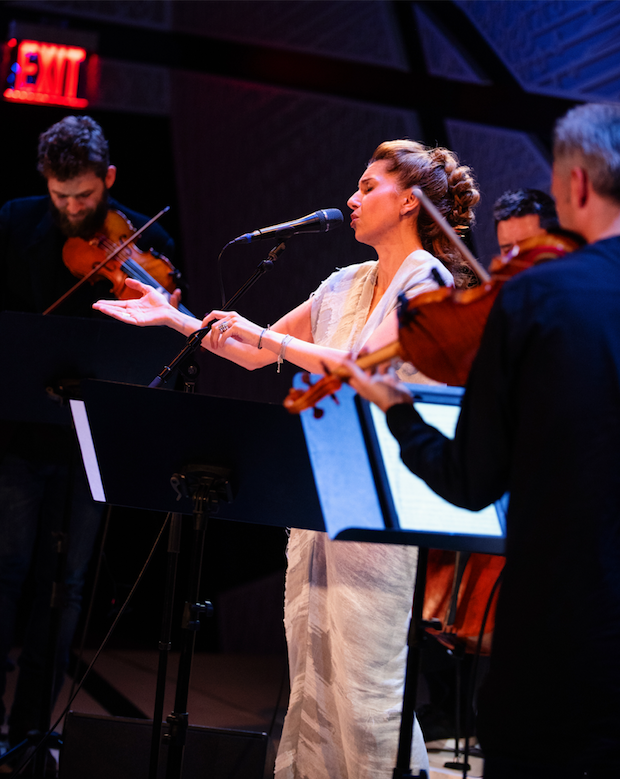 In 2017, she was invited to participate as a guest artist in an album celebrating renowned Mexican poet Octavio Paz and in Paco de Lucia’s tribute documentary La guitarra vuela, and she also celebrated the memory of the iconic Mercedes Sosa in New York along with Pedro Aznar and the Ed Simon Trio. 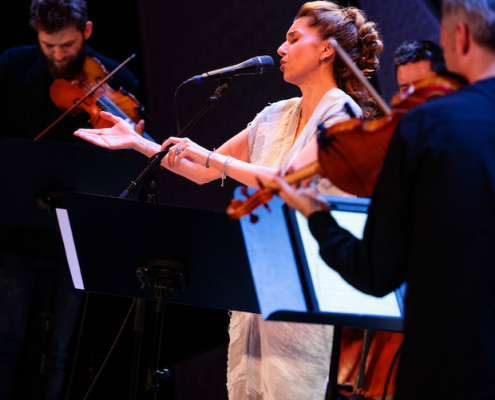 In September 2018, Magos released her most recent album, Dreamers (Sony Music), in collaboration with the celebrated string quartet Brooklyn Rider. Highly acclaimed by critics and audiences, the album rapidly rose to the #1 position on Amazon, the #2 position on iTunes, and the top lists of the New York Times, Billboard Classical, NPR Music, NPR Alt Latino, PRI’s The World, KPCC-FM, and KPFK’s Global Village; the album has been nominated for the international Grammys for Best Arrangement with the song “Niña”. The album includes gems of the Ibero-American songbook reimagined by a superb group of arrangers that includes Jaques Morelenbaum, Gonzalo Grau, Diego Schissi, Guillermo Klein, and Brooklyn Rider’s own Colin Jacobsen. In the same year, Magos received the Omecíhuatl Medal, an award granted by the Women’s Institute of the government of Mexico City in recognition of her outstanding contribution to the empowerment of women through the arts and culture; she has also been included as one of the most creative Mexicans in the world by Forbes Mexico Magazine. 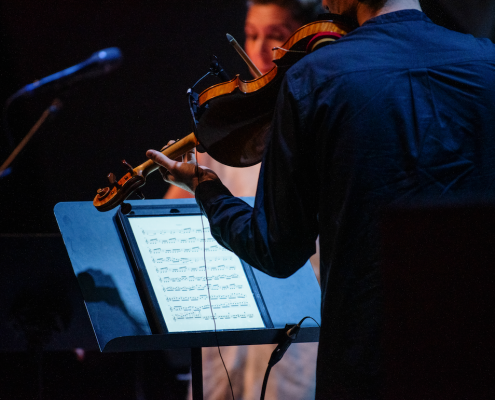 Hailed as “the future of chamber music” (Strings), the veteran string quartet Brooklyn Rider presents eclectic repertoire and gripping performances that continue to draw rave reviews from classical, world, and rock critics alike. NPR credits Brooklyn Rider with “recreating the 300-year-old form of the string quartet as a vital and creative 21st-century ensemble”. In the past year, Brooklyn Rider released Spontaneous Symbols on Johnny Gandelsman’s In a Circle Records label. 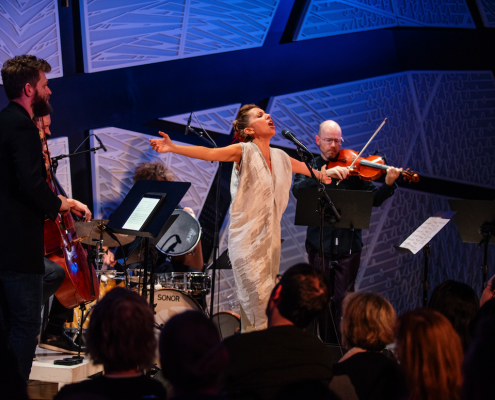 The album features new quartet music by Tyondai Braxton, Evan Ziporyn, Paula Matthusen, Kyle Sanna, and Brooklyn Rider violinist Colin Jacobsen. To mark the release, the group toured the northeast to perform music from the new album. 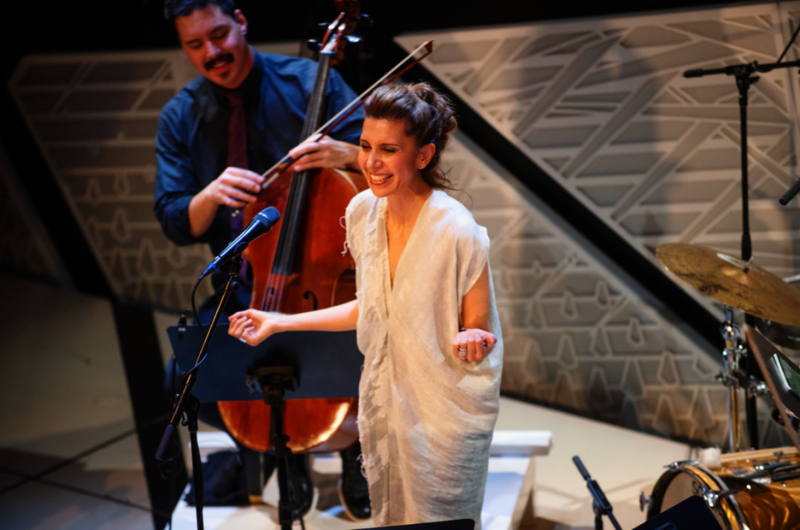 Works from that recording were also featured in live performance for Some of a Thousand Words, the ensemble’s recent collaboration with choreographer Brian Brooks and former New York City Ballet prima ballerina Wendy Whelan. 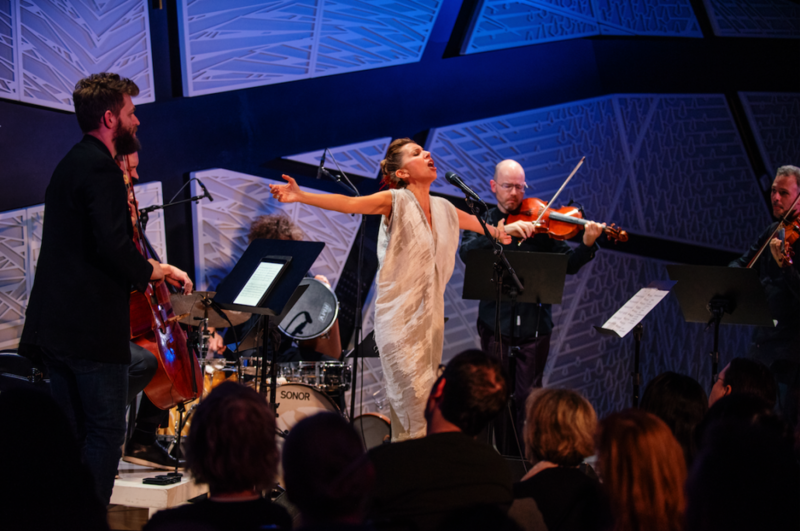 An intimate series of duets and solos in which the quartet’s live onstage music is a dynamic and central creative component, Some of a Thousand Words was featured at the 2016 Jacob’s Pillow Dance Festival before a US tour the following spring that included a week-long run at New York City’s Joyce Theater. This season, the quartet reunites with Whelan and Brooks for a second North American tour. They also team up with incomparable banjoist Béla Fleck — with whom they have appeared on two different albums, 2017’s Juno Concerto and 2013’s The Impostor — for concerts in Texas, Oklahoma, Arkansas, Colorado, and Montana. 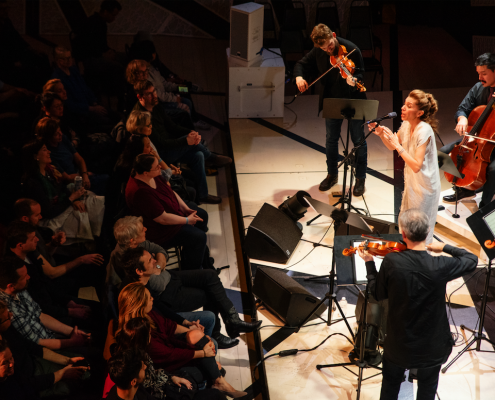 Also, in the spring, Brooklyn Rider partners with two instrumentalists who are at the forefront of their respective genres, jazz saxophonist Joshua Redman and Irish fiddle master Martin Hayes. The tours with Redman and Hayes are the product of multi-season collaborations that will continue beyond the spring and will include new recordings with both artists. Balancing these collaborations is a full schedule of quartet performances across the US as well as in the UK, Sweden, and Germany. 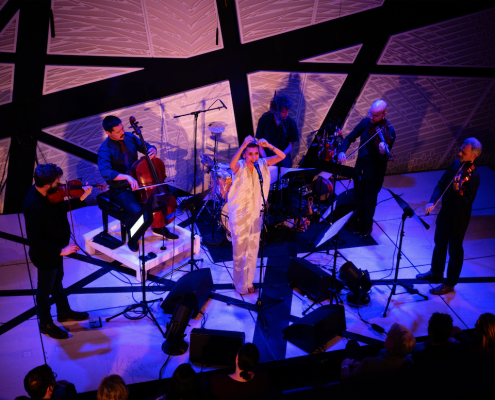 During the 2016-17 season, Brooklyn Rider released an album entitled so many things on Naïve Records with Swedish mezzo-soprano Anne Sofie von Otter, comprising music by Colin Jacobsen, Caroline Shaw, John Adams, Nico Muhly, Björk, Sting, Kate Bush, and Elvis Costello, among others. 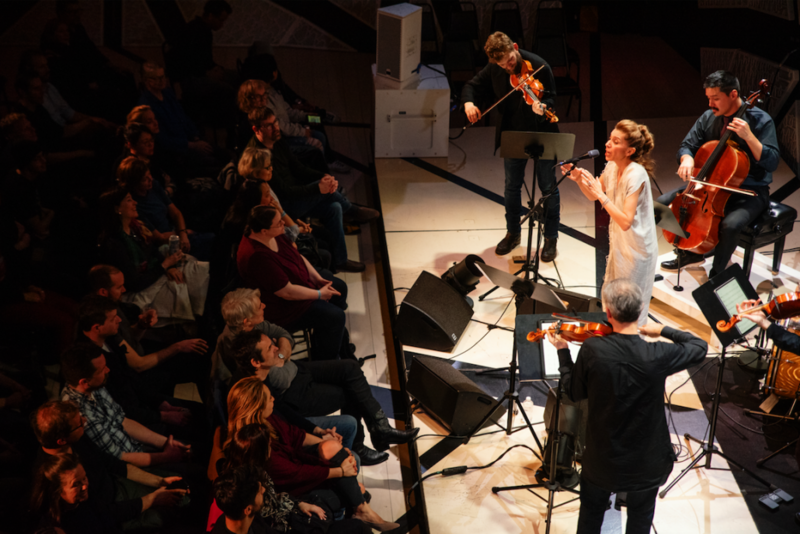 The group toured material from the album and more with von Otter in the US and Europe, including stops at Carnegie Hall and the Opernhaus Zürich. 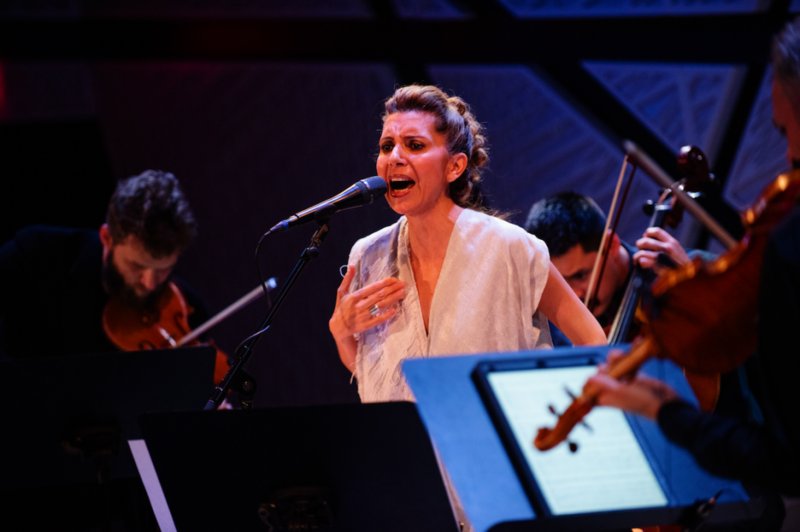 Additionally, Brooklyn Rider performed Philip Glass’s seventh string quartet, furthering a relationship with the iconic American composer that began with 2011’s much-praised Brooklyn Rider Plays Philip Glass and will continue with the upcoming album release of Glass’s recent quartets on the composer’s Orange Mountain Music label. 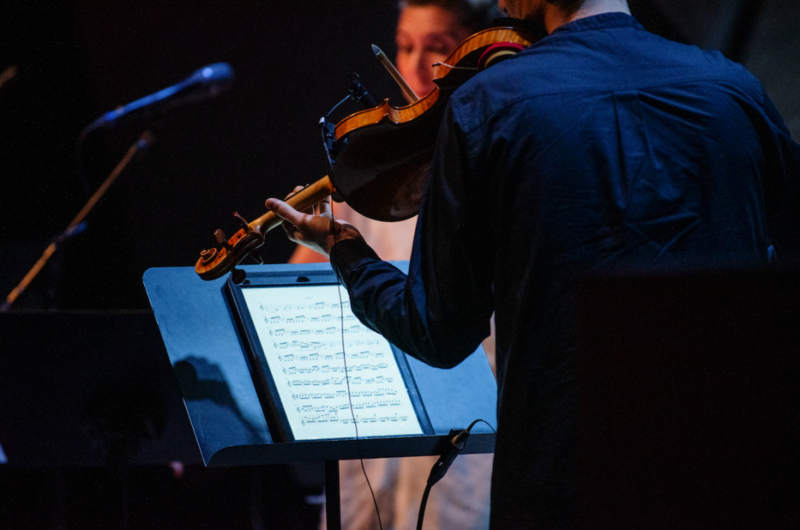 In 2015, the group celebrated its tenth anniversary with the groundbreaking multi-disciplinary project Brooklyn Rider Almanac, for which it recorded and toured 15 specially commissioned works, each inspired by a different artistic muse. 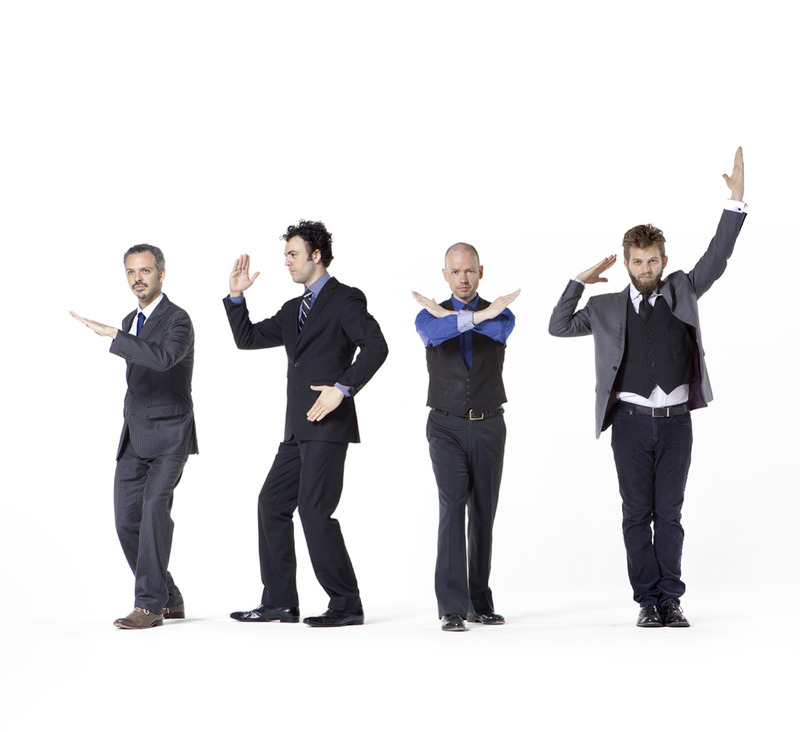 Other recording projects include the quartet’s eclectic debut recording in 2008, Passport, followed by Dominant Curve in 2010, Seven Steps in 2012, and A Walking Fire in 2013. 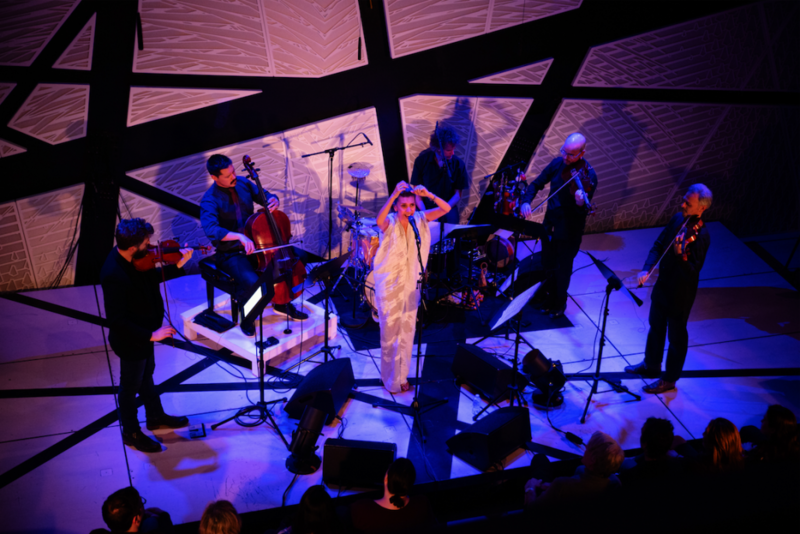 In 2016, they released The Fiction Issue with singer-songwriter Gabriel Kahane, with the title track a Kahane composition that was premiered in 2012 at Carnegie Hall by Kahane, Brooklyn Rider, and Shara Worden. A longstanding relationship between Brooklyn Rider and Iranian kamancheh player Kayhan Kalhor resulted in the much-praised 2008 recording, Silent City.